Head down to Canary Wharf to catch another countdown to the London 2012 Olympics. 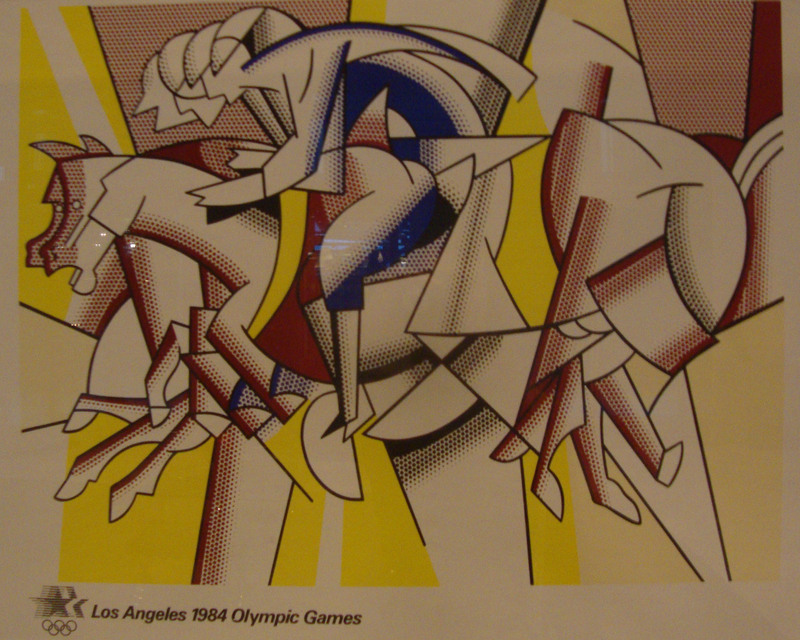 Borrowing work from the Victoria & Albert Museum’s acclaimed collection, One Canada Square offers up a collection of Olympic Games posters in its main lobby area. With One Canada Square being in East London and the fact it provided the office space for the London 2012 bid team this space feels like it should be the perfect location for this exhibition. This show features rare examples of posters created from the early twentieth century right up to posters produced for this year’s Games in London. The posters on display have been used as prime means of communication to herald the Games, build excitement and shape expectations or in the case of many Londoners, fill with utter dread. Within this fine collection of posters artists Andy Warhol and Roy Lichtenstein can be found who designed posters for the 1984 Winter and Summer games. Lichtenstein’s incredibly bright Los Angeles ’84 poster is based upon a painting by the Futurist Carlo Carra and reworked in the style of Fernand Leger. He uses curves and diagonals to create a sense of speed and excitement becoming a piece of art rather than a simple piece of advertising. The power of the posters on display comes from their broad appeal and their ability to relay messages through eye-catching and memorable imagery. They convey identity, politics, sports, art, place, commerce and culture. From advertising opportunities by corporate companies right through to politics, the posters cannot simply be described as Sports advertisement because they send so many messages to the viewer. 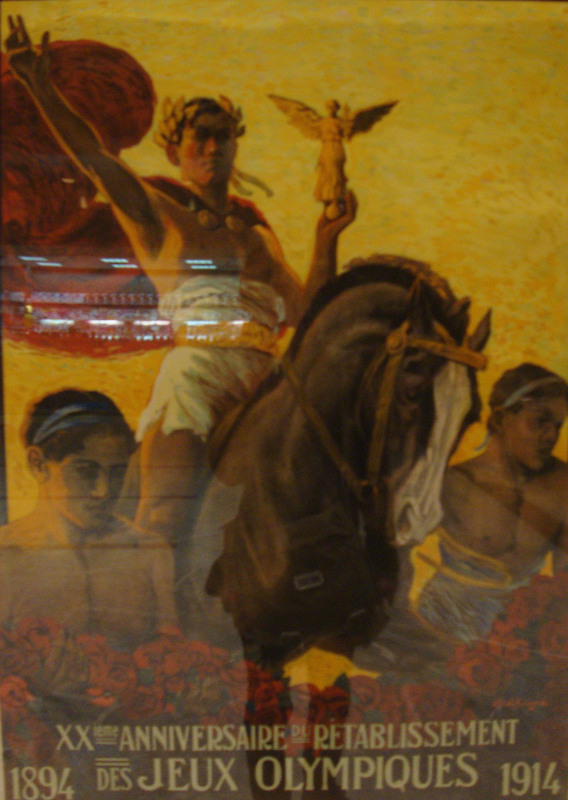 A poster taken from the 1936 Berlin Games demonstrates clear political motive and ambition in its imagery. The Berlin Games which were opened by Hitler on 6th February were promoted by a poster designed by one of Germany’s most distinguished poster designers Ludwig Hohlwein. 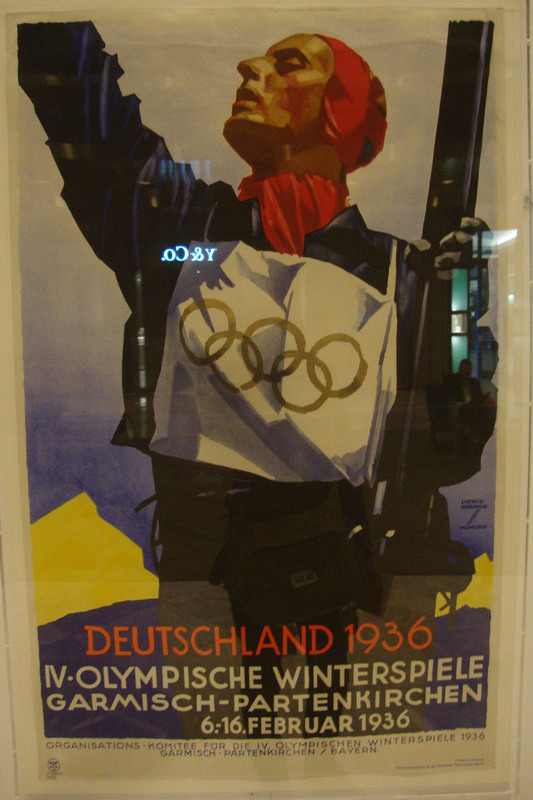 The poster shows a skier in a strong pose in bold colours with high tonal contrasts promoting the Nazi’s ‘Aryan Ideal’. The gun on his shoulder and the skier’s strong pose does not only relate to the event but alludes to Germany’s developing strength. The posters are magnificent; they give a broad range of national identities and politics and also show how commerce and brands form partnerships with the Games. 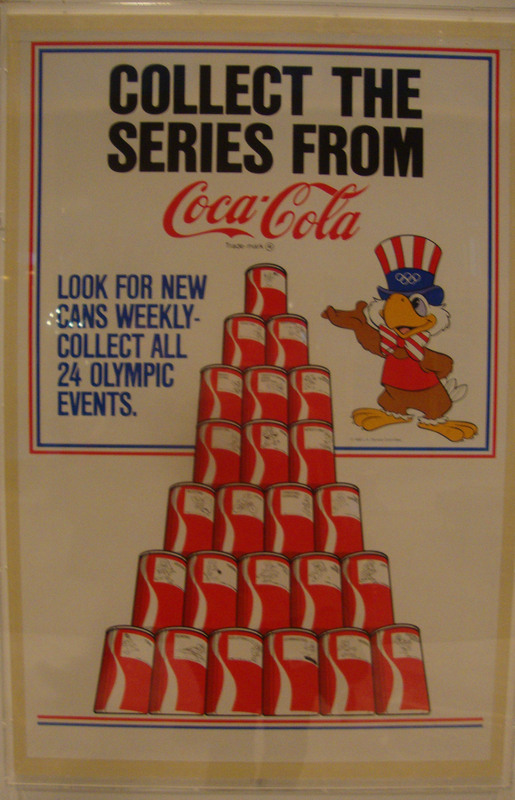 For example, the Coca Cola Company which produced an advertising poster for the Los Angeles games which promoted the company as well as the Olympics as a strong partnership that supported each other. This exhibition is great due to the various design styles on display by what doesn’t work however is the display. It fails to attract the attention of most passersby. Bearing in mind how busy Canada Square is, there is minimal promotion for the show and nothing that draws attention when you are even in the main lobby. The pieces are simply placed on the walls around the main structure of the building meaning visitors have to dodge workers as they try to make their way to their offices. This exhibition could have been amazing if it was separated from this work environment and placed into a temporary gallery space whereas here, it is missed easily. It is hard to disconnect from the busy work environment around you and really appreciate the posters. However, if you can brave angry City office workers who curse at you for being in their way, then do go see this exhibition as it offers the viewer a diverse range of styles and narratives in a simple yet extremely effective way.